From where I stand now, looking backwards, there are 4 clear dots in my mind that have connected to produce Women Talk Work. The first is my one of my favourite books when I was a child – House by Mouse. 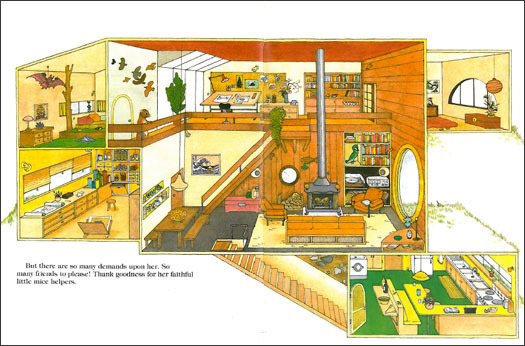 House by Mouse is a beautifully illustrated story about an architect mouse named Henrietta who designed functional, unique houses for all of her animal friends. The illustrations in the book are cross-sections of each of the homes and I loved how I could peek into each of these homes and see how these animals lived. I loved the detail of all of the ordinary features and the real insight you got into the lives of these animals and the work of Henrietta Mouse by looking ‘behind-the-scenes’ in the places they lived. The second dot is a 2012 trip to Las Vegas. The monorail in Vegas travels down The Strip, but at the back of the casinos and hotels, rather than the front. 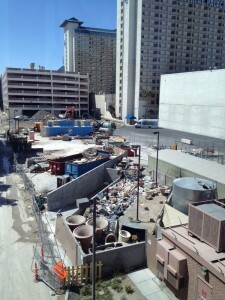 I was fascinated by this view of Vegas – watching the staff out the back of the hotels ferrying rubbish out to bins, the trucks making deliveries, the staff parking lots and the construction sites. I was far more interested in understanding how Vegas ‘worked’ and finding out the stories of the people that worked there, than in actually participating in the traditional Vegas activities. I wished there was some kind of behind-the-scenes tour I could do. I found this view of The Strip far more interesting! I started thinking about how I could satisfy my curiosity about what went on ‘behind-the-scenes’ in different workplaces, when last year I discovered Slate’s Working podcast – the third dot. It was unlike any other podcast I’d listened to and provided a very deep insight into what various jobs are really like. As a big fan of podcasts, I found this a fabulous medium for getting that ‘behind-the-scenes’ tour that I craved. And the fourth dot has been my own work over the last 18 months with YWCA Canberra. Working on a range of women’s leadership initiatives has certainly raised my awareness of gender inequality – particularly as it relates to work. But sometimes I wonder if discussion about women’s participation in the workforce, and barriers to women’s career advancement, tends to homogenise women’s experience of work. I also realised that I knew very little about what the jobs of my friends and family actually entailed, so I decided to put together my own podcast series to explore ‘work’ from the perspective of a range of different women in a range of different jobs. However, people who know me well know that I’m an ‘ideas person’, a starter of projects, but not a finisher, so applying (and receiving) the support of YWCA Canberra through their Great Ydeas Program not only gave me the financial support to kickstart the project, but also the public accountability to follow through. I look forward to hearing the stories and experiences of the women I speak to in the Women Talk Work interviews, but also to seeing what further dots are created or elicited as the project progresses.